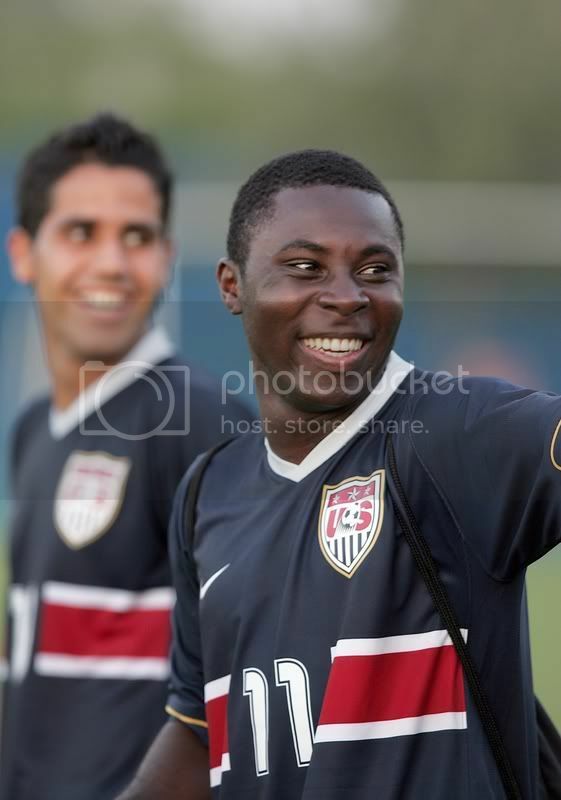 The good news is that the press release the team sent out had photos of Freddy Adu, such as the one above, by John Todd of International Sport Images who supplies photos for US Soccer. So, it would appear that Adu will be playing for the US in the match. Also, the Rhinos mentioned that New York Red Bulls forward Josmer Altidore will be a part of the US team. Unfortunately, it's unlikely that Lionel Messi will be a part of the Argentina team that comes to PAETEC Park. I would expect Messi to be a part of Argentina's Copa America squad this summer and to not be with their U-20s for the U-20 World Cup. Argentina's coach has hinted that he will have 2 or 3 players that weren't released by their European clubs for the qualifying round leading up to this summer's U-20 World Cup. So, Argentina could have players like Sergio Aguero, Mauro Zarate, Fernando Gago and Gonzalo Higuain, whom weren't a part of their qualifying run. It's going to be very interesting to see how this match draws in comparison to last year's appearance of the USWNT versus Mexico that was headlined by Abby Wambach. This match will start at 7pm on a school night (The USWNT game started at 8pm for ESPN2) and the $20 to $35 price range for tickets is higher than a ticket to a Rhinos regular season game at PAETEC. I hope that Rochester shows up with 10,000 plus fans in the seats for this match. But, I also wouldn't be surprised if the attendance were in the 6,000 to 7,000 range that the USWNT got last fall. Especially since the timeframe to create a buzz around this match is really compressed with the game being announced less than one month prior to it taking place. The rumor mill has a few EPL clubs showing an interest in American defender Frankie Simek. However, Simek is saying that he's happy with Sheffield Wednesday. Although, who knows how his tune will change if the offers get big? Toronto FC is still making moves. Adding Marvell Wynne and subtracting Richard Mulrooney wasn't enough. Now they've sent Conor Casey to Colorado. This appears to be similiar to the Mulrooney deal as Casey is from Colorado and there were rumors that he wanted to go to the Rapids when he first signed with MLS. One thing the Mulrooney and Casey deals do for Toronto FC is open up another foreigner slot as the only player they got back in the two deals is Canadian striker Riley O'Neill from Colorado. Ken Pendleton from US Soccer Players.com expresses a common lament in response to the Zidane to LA rumors: Why not spread the wealth? With NY and Chicago reportedly talking to Zidane and failing to get a deal done, my guess is that the pull of Beckham was the real reason that this has any shot at happening. But, with Columbus diving into the Designated Player pool this week, I don't see the way things have gone so far being that big of an issue. Especially if by 2008 there are only two or three teams without a Designated Player on their roster. With NY having two Designated Players and LA likely to have two as well, there will have to be at least two teams without a Designated Player slot. The New England Revolution seem to be happy that they only lost Clint Dempsey this offseason. The next big step is trying to find a way to keep Shalrie Joseph and make him happy to be there all at the same time. Adam Spangler at This Is American Soccer.com met up with Abby Wambach and Lindsay Tarpley at a meet and greet held by the USWNT. I guess my piece on the USWNT vs Mexico game wasn't enough coverage on his site for Abby's liking. Apparently there is a split amongst Arsenal leadership over the interest Stan Kroenke has in buying the EPL club. I wonder if things will get as ugly as they were when Malcolm Glazer was taking over Manchester United?